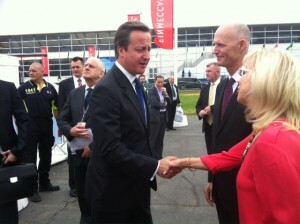 British Prime Minister David Cameron and Florida Governor Rick Scott met today at the Farnborough Air Show in the United Kingdom. They discussed the importance of the aerospace sector to the global and UK/Florida economies and their efforts to implement policies that create aerospace sector jobs in the UK and Florida. “The UK and Florida have significant trade and investment links as the world’s seventh and 20th largest economies, respectively. The UK is Florida’s largest foreign direct investor employing over 39,100 Floridians, and Florida is the largest long-haul destination for UK nationals with 1.3 million UK tourists visiting Florida every year,” Governor Scott said.